Convertor), can create a slightly positive pressure reducing atmosphere, apply such means as submerged arc heating, argon stirring, white slag refining, alloy composition trimming, wire feeding under the atmosphere to conduct degassing, desulfuration, decontamination for hot metal, and accurately control the ingredients and temperature of molten steel. 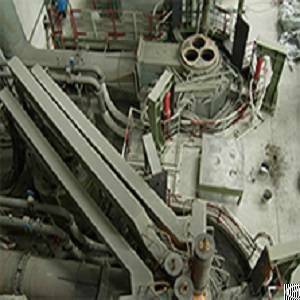 The equipment also has an effect of buffering and adjusting continuous casting links. Transformer for electric furnace, Network, Electrode lifting and lowering device, Ladle lid and ladle lid lifting and lowering device, Heating bridge frame, Steel ladle, Ladle carrier, Wire feeder, Argon regulating system, Water cooling system, Compressed air system, Hydraulic system, Temperature measurement and sampling system, Automatic charging system, High-voltage power supply system, Low-voltage electrical control system and automation system, etc. Company Name: Xi�an Tengye Metallurgical Engineering Co., Ltd.